Also commonly referred to as accounts receivable financing, in factoring a business sells its receivables to a 3rd party (factoring) company at a discount. The factoring company pays the business immediately and is paid by your customers later. Factoring is becoming more prevalent as business owners realize it is a debt-free way to get paid sooner so you can smooth out the gaps in your cash flow caused by slow-payers. Unlike accounts receivable financing or invoice discounting, in factoring you are making a sale and can use the money to suit your needs. So how does the process work? The factor, or the 3rd party funding company, advances most of the invoice amount to the business owner. Depending on how credit worthy of the business and business owner are of the billed customer, expect an advance between 70% and 90% of the invoice amount. When the bill is paid, the factor remits the balance not including a charged transaction fee. It is important to keep in mind that factoring relies more on the creditworthiness of your customers than on yours. A poor credit background could affect both the advanced rate as well as the potential interest rate at which you will be funded. 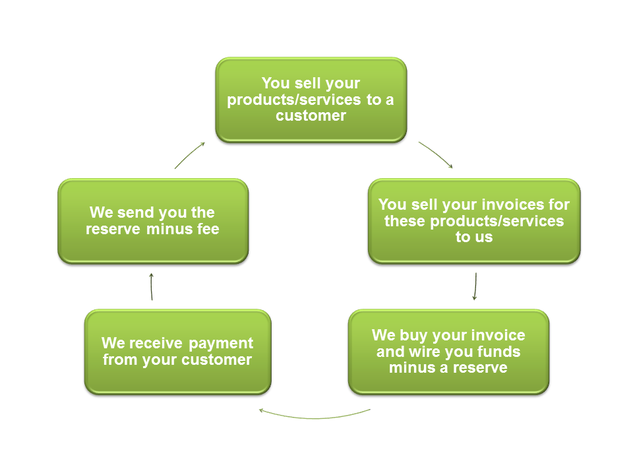 So, before you factor your invoices keep in mind the payment tendencies of each customer. Determine which customers tend to pay on time and those who pay late. Consider which clients have good or poor credit. If certain clients are habitually late paying debt it may make sense to factor these debts. Is my business even big enough to use factoring? Do not be hesitant to try factoring because you think your business is too small to do so. Companies of all sizes, from mom and pop shops to Fortune 500 corporations, rely heavily on factoring to increase cash flow for better business operations. Am I in the right industry? Factoring spans all industries including manufacturing, textiles, trucking and transportation, health care and staffing. How much do I need to factor? The simple answer to that questions is it depends on your unique situation. One company may choose to factor a few invoices while another my factor all invoice. That being said if you have read this far you may just want to give us a call or fill out our online application below. Somebody essentially assist to make severely articles I would state. This is the very first time I frequented your web page and up to now? I surprised with the analysis you made to make this actual post amazing. Wonderful task! voice yet, those call for a connect-in installation). Hi there,I check your blogs named “Factoring & Accounts Receivable Financing – CapitalFront” regularly.Your story-telling style is awesome, keep up the good work! And you can look our website about تحميل اغانى شعبى 2017. Have fun with your Mii on the Nintendo social program. to this point? I amazed with the research you made to make this actual put up amazing. I am really inspired together with your writing abilities as smartly as with the layout in your blog. Hi there colleagues, how is the whole thing, and what you wish for to say on the topic of this piece of writing, in my view its genuinely amazing for me. Every weekend i used to pay a visit this site, because i wish for enjoyment, since this this web site conations truly pleasant funny material too. Very great post. I just stumbled upon your blog and wished to mention that I’ve really enjoyed browsing your blog posts.